Today is CX Day – a day to celebrate the professionals and companies that make great customer experiences happen. 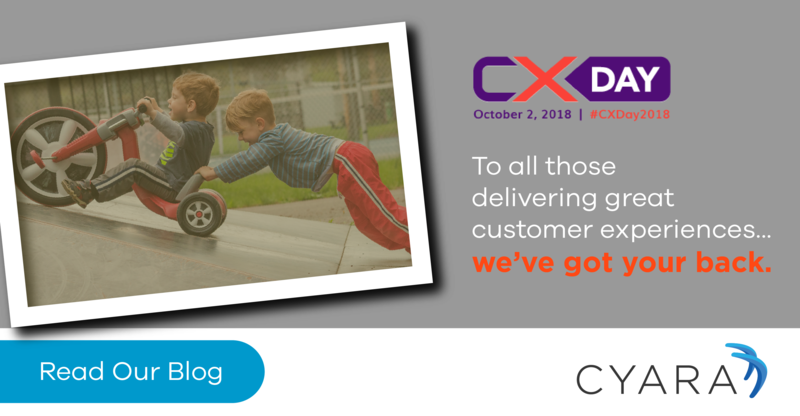 So, on this sixth annual CX Day—created by the Customer Experience Professionals Association (CXPA)—I’ve gathered six top insights and observations that I’ve gleaned from Cyara’s customers and fellow CX fanatics over the past year. 1. CX should be at the center of your digital transformation. Customer communications are an integral part of the CX landscape and need to be a key component of any digital transformation. For many companies, digital transformation investments are passing over the contact center, and we’ve seen that that gap can be disastrous. Recent studies show that while digital channels are growing rapidly, the phone is still the preferred communications channel for pre- and post-sales support. 2. Without CX measurement, you’re flying blind. From the anecdotal to the hard stats, make sure you really know how your CX is performing. CX leaders rely on a variety of metrics—from the big-picture metrics of Net Promoter Scores (NPS) and Customer Satisfaction (CSAT) to real-time metrics such as dropped calls and correct connections. This big-picture data enables you to sum up the impact of your efforts, while real-time metrics deliver the insights you need to maintain quality, and to identify and quickly address issues. 3. CX innovation comes to life with cross-team collaboration. With the push for continuous integration and real-time innovation of front-line customer experience systems, it’s critical for organizations to successfully collaborate across development, testing, and operations teams, as well as between IT teams and business teams. Having a shared vision and collaboration tools are key to working in an agile, fast-paced mode of development. 4. Spikes happen, so be prepared. Whether it’s Black Friday, annual insurance enrollment, or holiday travel, each business sector has its own ups and downs, big product launches, and unique high-volume seasons. Spikes might also be related to unpredictable upticks like a dramatic increase in insurance inquiries after a natural disaster. Make sure you load test and ensure your system can handle those spikes, rather than finding out you're under-provisioned when in-bound calls go through the roof. 5. Principles for strong CX are universal. Cyara works with companies of all sizes across many industries and geographies. We see regions with unique attributes, industry-specific regulations, and compliance requirements. Certainly, every company has its own brand values and personality—so implementations certainly vary—but the principles of world-class CX leaders remain consistent. The attributes I consistently see with those who are most successful include: prioritization of the customer experience, a cross-team dedication to excellent customer service, a culture of CX innovation, and a strong commitment to the day-to-day work of delivering. 6. Never lose sight of the personal side of CX. As a CX technology provider, I’m obviously a proponent of applying technology to automate, test, manage, and deliver on your CX. Today, there’s also a great deal of excitement about what’s on the horizon with AI and chatbots. All that’s great, but all this technology has to be applied in service to each individual customer’s experience. Technology must help support the company’s commitment and mission, it must empower your frontline agent, and support every touchpoint with the customer. Today’s leading brands understand that today’s economy is an experience economy, and that with great CX, they can differentiate themselves and earn customer loyalty. So take a moment to learn from the best, exchange notes with your peers, and take today to celebrate your CX success. How about a tech-free team dinner this week? To learn more about how Cyara can help you, contact us, or get in touch with your Account Executive.